Alex X. Liu (Google Scholar, DBLP) received his Ph.D. degree in Computer Science from The University of Texas at Austin in 2006. He received the IEEE & IFIP William C. Carter Award in 2004, the National Science Foundation CAREER Award in 2009, the Michigan State University Withrow Distinguished Scholar (Junior) Award in 2011, the Michigan State University Withrow Distinguished Scholar (Senior) Award in 2019. He has served as an Editor for IEEE/ACM Transactions on Networking from 2012 to 2017,, and he is currently an Associate Editor for IEEE Transactions on Dependable and Secure Computing and IEEE Transactions on Mobile Computing, and an Area Editor for Computer Communications. He has served as the TPC Co-Chair for ICNP 2014 and IFIP Networking 2019. He received Best Paper Awards from ICNP-2012, SRDS-2012, and LISA-2010. His research interests focus on networking and security. He is a Fellow of the IEEE . My Ph.D. student, Muhammad Shahzad, has joined the Department of Computer Science at North Carolina State University as a tenure-track Assistant Professor in Fall 2015 right after he graduated from MSU. He has received 12 tenure track Assistant Professor offers from reputed universities in U.S. The College of Engineering of NCSU ranks 28th in U.S. News. He has received three NSF award. Many congratulations to Muhammad! My Ph.D. student, Zubair Shafiq, has joined the Department of Computer Science at The University of Iowa as a tenure-track Assistant Professor in Fall 2014 right after he graduated from MSU. By 2018, he has received four NSF awards with him being the PI, one of which is NSF CAREER Award. Many congratulations to Zubair! Five of my Ph.D. students (Faraz Ahmed, Muhammad Shahzad, Zubair Shafiq, Fei Chen, and Chad Meiners) won the College Outstanding Graduate Student Award (Fitch Beach), Three (Ali Munir, Muhammad Shahzad, and Chad Meiners) won the Department Outstanding Graduate Student Award, and one (Faraz Ahmed) won the Department Outstanding Teaching Award. Of the 8 Ph.D. students that I graduated, 2 joined academia (University of Iowa and North Carolina State University), 4 joined research labs (MIT Liconln Laboratory, HP Labs, Huawei Research Labs in California, and Huawei Research Lab at Hong Kong), two started their own startup in California. Best Poster Award - IEEE International Conference on Network Protocols (ICNP), 2016. Best Poster Award - IEEE International Conference on Network Protocols (ICNP), 2009. James C. Browne Outstanding Graduate Student Fellowship - The University of Texas at Austin (2 winners in the Computer Science Department per year), 2005. This award is presented annually to recognize outstanding graduate students in computer sciences. 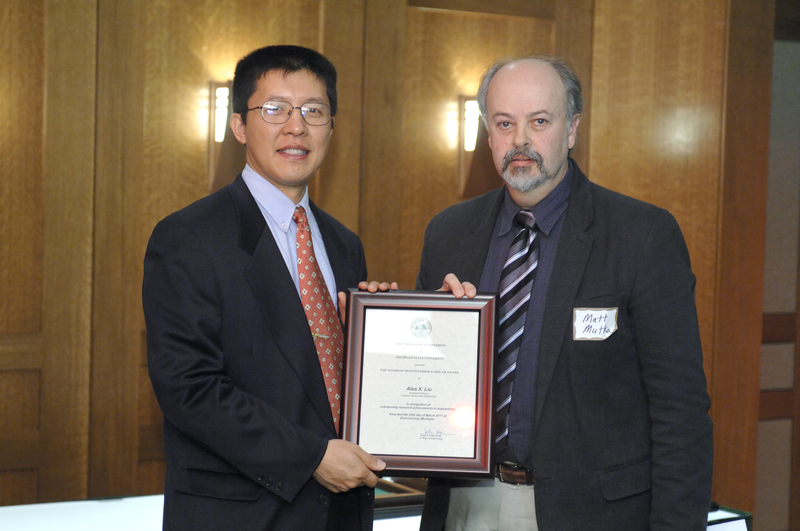 William C. Carter Award - IEEE & IFIP, 2004. This award is presented annually, with the citation, "to recognize an individual who has made a significant contribution to the field of dependable computing through his or her graduate dissertation research". This award is sponsored by IEEE Computer Society Technical Committee on Fault-Tolerant Computing and IFIP Working Group 10.4 on Dependable Computing and Fault Tolerance. Alex X. Liu, Muhammad Shahzad, Xiulong Liu, and Keqiu Li. The Institution of Engineering and Technology. ISBN-10: 1785613324. ISBN-13: 978-1785613326. December 2017. World Scientific Publishing Company. ISBN-10: 9814261653. ISBN-13: 9789814261654. December 2010. Springer. ISBN-10: 1441966994. ISBN-13: 9781441966995. June 2010. In Proceedings of the 35th IEEE International Conference on Data Engineering (ICDE), Macau SAR, April 2019. Shuyu Shi, Yaxiong Xie, Alex X. Liu, Jun Zhao, and Mo Li. In Proceedings of the 38th Annual IEEE International Conference on Computer Communications (INFOCOM), Paris, France, April, 2019. Acceptance rate: 288/1464 = 19.7%. Zeshui Li, Haipeng Dai, Wei Wang, Alex X. Liu, and Guihai Chen. In Proceedings of the ACM International Joint Conference on Pervasive and Ubiquitous Computing (UbiComp), London, UK, September, 2019. Kamran Ali, Alex X. Liu, Ioannis Pefkianakis, Kyu-Han Kim. In Proceedings of the 26th IEEE International Conference on Network Protocols (ICNP), Cambridge, UK, September, 2018. Nan Yu, Wei Wang, Alex X. Liu, and Lingtao Kong. In Proceedings of the 20th ACM International Joint Conference on Pervasive and Ubiquitous Computing (UBICOMP), Singapore, October 2018. Haipeng Dai, Ke Sun, Alex X. Liu, Lijun Zhang, Jiaqi Zheng and Guihai Chen. In Proceedings of the 47th International Conference on Parallel Processing (ICPP), pages 10:1-10:10, Eugene, Oregon, August, 2018. Qian Liu, Haipeng Dai, Alex X. Liu, Qi Li, Xiaoyu Wang and Jiaqi Zheng. In Proceedings of the 47th International Conference on Parallel Processing (ICPP), pages 40:1-40:10, Eugene, Oregon, August, 2018. Ke Sun, Wei Wang, Alex X. Liu, and Haipeng Dai. In Proceedings of the 16th ACM International Conference on Mobile Systems, Applications, and Services (MobiSys), Munich, Germany, June, 2018. Kang Ling, Haipeng Dai, Yuntang Liu, and Alex X. Liu. In Proceedings of the IEEE International Conference on Sensing, Communication and Networking (SECON), Hong Kong, June 2018. Lei Wang, Ke Sun, Haipeng Dai, Alex X. Liu, and Xiaoyu Wang. Xinyu Lei, Guan-Hua Tu, Alex X. Liu, Chi-Yu Li, and Tian Xie. In Proceedings of the 6th IEEE Conference on Communications and Network Security (CNS), Beijing, China, May 2018. Haipeng Dai, Meng Li, and Alex X. Liu. In Proceedings of the 37th Annual IEEE International Conference on Computer Communications (INFOCOM), Honolulu, HI, April, 2018. Nan Yu, Haipeng Dai, Alex X. Liu, and Bingchuan Tian. Tong Yang, Alex X. Liu, Qiaobin Fu, and Xiaoming Li. Ali Munir, Zhiyun Qian, Zubair Shafiq, Alex X. Liu, and Franck Le. In Proceedings of the 25th IEEE International Conference on Network Protocols (ICNP), Toronto, Canada, October, 2017. Haipeng Dai, Muhammad Shahzad, Alex X. Liu, and Yuankun Zhong. In Proceedings of the 43th International Conference on Very Large Data Bases (VLDB), Munich, Germany, August, 2017. Haipeng Dai, Huizhen Ma, Alex X. Liu. In Proceedings of the 18th International Symposium on Mobile Ad Hoc Networking and Computing (MobiHoc), Madras, India, July, 2017. In Proceedings of the 37th IEEE International Conference on Distributed Computing Systems (ICDCS), Atlanta, GA, June 2017. Muhammad Shahzad and Alex X. Liu. M. Zubair Shafiq and Alex X. Liu. In Proceedings of the 16th IEEE-IFIP Networking Conference (Networking), Stockholm, Sweden, June, 2017. Bruhadeshwar Bezawada, Alex X. Liu, Xiaojiang Liang, and Rui Li. Faraz Ahmed, Zihui Ge, Alex X. Liu, Jia Wang, and He Yan. In Proceedings of the 36th Annual IEEE International Conference on Computer Communications (INFOCOM), Atlanta, Georgia, May, 2017. Haipeng Dai, Xiaoyu Wang, Alex X. Liu, Huizhen Ma, and Guihai Chen. Chen Tian, Ali Munir, Alex X. Liu, Yingtong Liu, Yanzhao Li, Jiajun Sun, Fan Zhang, ang Gong Zhang. Qiuxia Chen, Dongdong Ding, Xu Wang, Alex X. Liu, and Ali Munir. In Proceedings of the 3rd IEEE International Conference on Smart Computing (SMARTCOMP), Hong Kong, China, May, 2017. Xinyu Lei, Alex X. Liu, and Rui Li. In Proceedings of the 33th IEEE International Conference on Data Engineering (ICDE), San Diego, California, May, 2017. Ali Munir, Ting He, Ramya Raghavendra, Franck Le, and Alex Liu. In Proceedings of the 12th International Conference on emerging Networking EXperiments and Technologies (CoNEXT), pages 221-235, Irvine, California, December, 2016. Xun Zhou, Amin Vahedian Khezerlou, Alex Liu, M.Zubair Shafiq, and Fan Zhang. In Proceedings of the 24th ACM SIGSPATIAL International Conference on Advances in Geographic Information Systems (SIGSPATIAL), San Francisco, California, November, 2016. Sorrachai Yingchareonthawornchai, James Daly, Alex X. Liu, and Eric Torng. In Proceedings of the 24th IEEE International Conference on Network Protocols (ICNP), Singapore, November 2016. Faraz Ahmed, M. Zubair Shafiq, Amir R. Khakpour, and Alex X. Liu. Haipeng Dai, Xiaoyu Wang, Alex Liu, Fengmin Zhang, Yang Zhao, and Guihai Chen. Chen Tian, Alex X. Liu, Ali Munir, and Jie Yang. Kamran Ali, Ioannis Pefkianakis, Alex X. Liu, and Kyu-Han Kim. Chen Tian, Junhua Yan, Alex X. Liu, Yizhou Tang, Yuankun Zhong, and Zi Li. Tong Yang, Alex X. Liu, Qiaobin Fu, Dongsheng Yang, Steve Uhlig, and Xiaoming Li. Bruhadeshwar Bezawada, Xiaojiang Liang, Alex Liu, and Rui Li. Fucai Zhou, Yuxi Li, Alex X Liu, Muqing Lin, and Zifeng Xu. In Proceedings of the 10th International Conference on Provable Security (ProvSec), Nanjing, China, November 2016. Huigui Rong, Xun Zhou, Chang Yang, M.Zubair Shafiq, and Alex Liu. In Proceedings of the 25th ACM International Conference on Information and Knowledge Management (CIKM), Indianapolis, Indiana, October 2016. In Proceedings of the 22th ACM Annual International Conference on Mobile Computing and Networking (MOBICOM), New York City, New York, October 2016. In Proceedings of the 18th ACM International Joint Conference on Pervasive and Ubiquitous Computing (UBICOMP), HeidelBerg, Germany, September 2016. In Proceedings of the 42th International Conference on Very Large Data Bases (VLDB), Vol. 9, New Delhi, India, September, 2016. Haipeng Dai, Alex X. Liu, Yuankun Zhong, Wei Wang, and Meng Li. In Proceedings of the ACM International Conference on Measurement and Modeling of Computer Systems (SIGMETRICS), Antibes Juan-les-Pins, France, June 2016. Faraz Ahmed, M. Zubair Shafiq, and Alex X. Liu. In Proceedings of the 36th IEEE International Conference on Distributed Computing Systems (ICDCS), Antibes Juan-les-Pins, France, June 2016. Faraz Ahmed, Alex X. Liu, and Rong Jin. Eric Norige and Alex X. Liu. Amir R. Khakpour, Alex X. Liu, and Bruhadeshwar Bezawada. Ann L. Wang, Muhammad Shahzad, Alex X. Liu. In Proceedings of the IEEE-IFIP Networking Conference (Networking), Vienna, Austria, May, 2016. In Proceedings of the 35th Annual IEEE International Conference on Computer Communications (INFOCOM), San Francisco, California, April, 2016. In Proceedings of the 23rd IEEE International Conference on Network Protocols (ICNP), San Francisco, California, November, 2015. In Proceedings of the 21th ACM Annual International Conference on Mobile Computing and Networking (MOBICOM), Paris, France, September 2015. Bezawada Bruhadeshwar, Alex X. Liu, Bargav Jayaraman, Ann L. Wang, and Rui Li. In Proceedings of the 35th IEEE International Conference on Distributed Computing Systems (ICDCS), Columbus, Ohio, June 2015. Eric Norige, Sailesh Kumar, and Alex X. Liu. In Proceedings of the 52nd ACM Design Automation Conference (DAC), San Francisco, California, June 2015. Faraz Ahmed, Jeffrey Erman, Zihui Ge, Alex X. Liu, Jia Wang, and He Yan. In Proceedings of the the ACM International Conference on Measurement and Modeling of Computer Systems (SIGMETRICS), Portland, Oregon, June 2015. Longfei Shangguan, Zheng Yang, Alex X. Liu, Zimu Zhou, and Yunhao Liu. In Proceedings of the 12nd USENIX Symposium on Networked Systems Design and Implementation (NSDI), Oakland, California, May, 2015. Shahzad Muhammad and Alex X. Liu. In Proceedings of the 34rd Annual IEEE International Conference on Computer Communications (INFOCOM), Hong Kong, China, April, 2015. Han Ding, Jinsong Han, Alex X. Liu, Jizhong Zhao, Panlong Yang, Wei Xi, and Zhiping Jiang. Xiulong Liu, Bin Xiao, Keqiu Li, Jie Wu, Alex X. Liu, Heng Qi, and Xin Xie. Rui Li, Alex X. Liu, Ann L. Wang, and Bezawada Bruhadeshwar. In Proceedings of the 40th International Conference on Very Large Data Bases (VLDB), Vol. 7, No. 14, Hangzhou, China, September, 2014. Ali Munir, Ghufran Baig, Syed Muhammad Irteza, Ihsan Ayyub Qazi, Alex X. Liu, Fahad Dogar. In Proceedings of the ACM SIGCOMM Conference (SIGCOMM), Chicago, Illinois, August, 2014. Tong Yang, Gaogang xie, Yanbiao Li, Qiaobin Fu, Alex X. Liu, Qi Li, Laurent Mathy. In Proceedings of the ACM International Conference on Measurement and Modeling of Computer Systems (SIGMETRICS), Austin, Texas, June 2014. M. Zubair Shafiq, Jeffrey Erman, Lusheng Ji, Alex X. Liu, Jeffrey Pang, and Jia Wang. M. Zubair Shafiq, Alex X. Liu, and Amir Khakpour. In Proceedings of the 51st ACM Design Automation Conference (DAC), San Francisco, CA, June 2014. Fei Chen and Alex X. Liu. In Proceedings of the IEEE-IFIP Networking Conference (Networking), Trondheim, Norway, June 2014. In Proceedings of the Sixth ASE International Conference on Social Computing (SocialCom-Stanford), Standford, California, May 2014. Alex X. Liu and Eric Torng. In Proceedings of the 33rd Annual IEEE International Conference on Computer Communications (INFOCOM), Toronto, Canada, April, 2014. Alex X. Liu, Chad Meiners, and Eric Torng. Zubair Shafiq, Franck Le, Mudhakar Srivatsa, and Alex X. Liu. In Proceedings of the 12th ACM Workshop on Hot Topics in Networks (HotNets), pages 1-7, College Park, MD, November, 2013. Alex X. Liu, Eric Norige, and Sailesh Kumar. In Proceedings of the 21st IEEE International Conference on Network Protocols (ICNP), Gottingen, Germany, October, 2013. Muhammad U. Ilyas, M. Zubair Shafiq, Alex X. Liu, Hayder Radha. Eric Norige, Alex X. Liu, and Eric Torng. In Proceedings of the 9th ACM/IEEE Symposium on Architectures for Networking and Communications Systems (ANCS), pages 95-104, San Jose, California, October, 2013. Kun Huang, Linxuan Ding, Gaogang Xie, Dafang Zhang, Alex X. Liu, and Kave Salamatian. In Proceedings of the 9th ACM/IEEE Symposium on Architectures for Networking and Communications Systems (ANCS), pages 83-93, San Jose, California, October, 2013. Yanbiao Li, Dafang Zhang, Alex.Liu, Jintao Zheng. In Proceedings of the 9th ACM/IEEE Symposium on Architectures for Networking and Communications Systems (ANCS), pages 1-12, San Jose, California, October, 2013. Xiulong Liu, Heng Qi, Keqiu Li, Yanming Shen, Alex X. Liu, and Wenyu Qu. In Proceedings of the 10th IEEE International Conference on Mobile Ad-hoc and Sensor Systems (MASS), pages 95-103, Hangzhou, China, October, 2013. In Proceedings of the 42nd IEEE International Conference on Parallel Processing (ICPP), pages 130-139, Lyon, France, October, 2013. In Proceedings of the 19th ACM Annual International Conference on Mobile Computing and Networking (MOBICOM), pages 39-50, Miami, Florida, September 2013. In Proceedings of the ACM International Conference on Measurement and Modeling of Computer Systems (SIGMETRICS), pages 293-304, Pittsburgh, PA, June 2013. Average review score ranks 3rd among all submissions. M. Zubair Shafiq, Lusheng Ji, Alex X. Liu, Jeffrey Pang, Shobha Venkataraman, and Jia Wang. In Proceedings of the ACM International Conference on Measurement and Modeling of Computer Systems (SIGMETRICS), pages 17-28, Pittsburgh, Pennsylvania, June 2013. James Daly, Alex X. Liu, and Eric Torng. In Proceedings of the 32th Annual IEEE Conference on Computer Communications (INFOCOM), pages 2040-2048, Turin, Italy, April 2013. In Proceedings of the 32th Annual IEEE Conference on Computer Communications (INFOCOM), pages 1950-1958, Turin, Italy, April 2013. In Proceedings of the 27th IEEE International Parallel and Distributed Processing Symposium (IPDPS), pages 1159-1170, Boston, Massachusetts, April 2013. Yipeng Wang, Xiaochun Yun, M. Zubair Shafiq, Liyan Wang, Alex X. Liu, Zhibin Zhang, Danfeng(Daphne) Yao, Yongzheng Zhang, and Li Guo. In Proceedings of the 20th IEEE International Conference on Network Protocols (ICNP), pages 1-10, Austin, Texas, October 2012. Amir R. Khakpour and Alex X. Liu. In Proceedings of the 31st IEEE International Symposium on Reliable Distributed Systems (SRDS), pages 41-50, Irvine, California, October 2012. In Proceedings of the 18th ACM Annual International Conference on Mobile Computing and Networking (MOBICOM), pages 365-376, Istanbul, Turkey, August 2012. In Proceedings of the ACM International Conference on Measurement and Modeling of Computer Systems (SIGMETRICS), pages 65-76, London, United Kingdom, June 2012. In Proceedings of the 34th International Conference on Software Engineering (ICSE), Zurich, Switzerland, June 2012. In Proceedings of the 10th International Conference on Applied Cryptography and Network Security (ACNS), pages 363-380, Singapore, June 2012. In Proceedings of the 11th IFIP International Conferences on Networking (Networking), pages 71-83, Prague, Czech Republic, May 2012. Acceptance rate: 64/225 = 28.4%. Chad Meiners, Eric Norige, Alex X. Liu, and Eric Torng. In Proceedings of the 31th Annual IEEE Conference on Computer Communications (INFOCOM), pages 1746-1754, Orlando, Florida, March 2012. M. Zubair Shafiq, Lusheng Ji, Alex X. Liu, Jeffrey Pang, and Jia Wang. In Proceedings of the 31th Annual IEEE Conference on Computer Communications (INFOCOM), pages 1341-1349, Orlando, Florida, March 2012. Amir R. Khakpour, Joshua W. Hulst, Zihui Ge, Alex X. Liu, Dan Pei, and Jia Wang. In Proceedings of the 31th Annual IEEE Conference on Computer Communications (INFOCOM), pages 1728-1736, Orlando, Florida, March 2012. In Proceedings of the 19th Annual Network & Distributed System Security Symposium (NDSS), San Diego, California, February 2012. In Proceedings of the 19th IEEE International Conference on Network Protocols (ICNP), pages 155-164, Vancouver, Canada, October 2011. In Proceedings of the 7th ACM/IEEE Symposium on Architectures for Networking and Communications Systems (ANCS), pages 200-210, Brooklyn, New York, October 2011. In Proceedings of the ACM Conference on Bioinformatics, Computational Biology and Biomedicine (BCB), pages 209-217, Chicago, Illinois, August 2011. In Proceedings of the International Conference on Measurement and Modeling of Computer Systems (SIGMETRICS), pages 305-316, San Jose, California, June 2011. In Proceedings of the International Conferences on Networking (Networking), pages 294-306, Valencia, Spain, May 2011. Acceptance rate: 64/294 = 21.7%. In Proceedings of the 30th Annual IEEE Conference on Computer Communications (INFOCOM), pages 2903-2911, Shanghai, China, April 2011. Acceptance rate: 291/1283 = 15.9%. In Proceedings of the 30th Annual IEEE Conference on Computer Communications (INFOCOM) Mini-Conference, pages 561-565, Shanghai, China, April 2011. Acceptance rate: (291+136)/1283 = 23.4%. In Proceedings of the 30th Annual IEEE Conference on Computer Communications (INFOCOM) Mini-Conference, pages 46-50, Shanghai, China, April 2011. In Proceedings of the 30th Annual IEEE Conference on Computer Communications (INFOCOM) Mini-Conference, pages 306-310, Shanghai, China, April 2011. In Proceedings of the 27th IEEE International Conference on Data Engineering, (ICDE), pages 553-564, Hannover, Germany, April, 2011. Acceptance rate: 98/494 = 19.8%. In Proceedings of the 24th USENIX Large Installation System Administration Conference (USENIX LISA), pages 75-90, San Jose, California, November 2010. In Proceedings of the 36th International Conference on Very Large Data Bases (VLDB), pages 409-416, Singapore, September 2010. Acceptance rate: 48/261 = 18.4%. In Proceedings of the 19th USENIX Security Symposium (USENIX Security), pages 111-126, Washington, DC, August 2010. Acceptance rate: 30/202 = 14.8%. In Proceedings of the 29th International Conference on Distributed Computing Systems (ICDCS), pages 817-826, Genoa, Italy, June 2010. Acceptance rate: 84/585 = 14%. In Proceedings of the 29th Annual IEEE Conference on Computer Communications (INFOCOM), pages 2642-2650, San Diego, California, March 2010. Kanthakumar Pongaliur, Li Xiao, Alex X. Liu. In Proceedings of the IEEE International Symposium on Trust, Security and Privacy for Pervasive Applications (TSP), pages 848-855, Macau, China, October, 2009. In Proceedings of the 17th IEEE International Conference on Network Protocols (ICNP), pages 93-102, Princeton, New Jersey, October 2009. In Proceedings of the 28th IEEE International Symposium on Reliable Distributed Systems (SRDS), pages 100-106, Niagara Falls, New York, September 2009. In Proceedings of the International Conference on Measurement and Modeling of Computer Systems (SIGMETRICS), pages 73-84, Seattle, Washington, June 2009. Acceptance rate: 27/180 = 15%. In Proceedings of the 29th International Conference on Distributed Computing Systems (ICDCS), pages 510-517, Montreal, Quebec, Canada, June 2009. Acceptance rate: 74/455 = 16%. In Proceedings of the Annual ACM SIGACT-SIGOPS Symposium on Principles of Distributed Computing (PODC), pages 95-104, Toronto, Canada, August 2008. Average review score = (4 + 4 + 4)/3 = 4 out of 5. In Proceedings of the International Conference on Measurement and Modeling of Computer Systems (SIGMETRICS), Pages 265-276, Annapolis, Maryland, June 2008. Acceptance rate: 36/201 = 18%. Average review score = 8.7 out of 10. Ranked 2nd among all submissions. In Proceedings of the 27th Annual IEEE Conference on Computer Communications (INFOCOM), pages 574-582, Phoenix, Arizona, April 2008. Average review score = (4 + 4 + 4)/3 = 4. In Proceedings of the 27th Annual IEEE Conference on Computer Communications (INFOCOM), pages 691-699, Phoenix, Arizona, April 2008. In Proceedings of the 12th European Symposium Research Computer Security (ESORICS), pages 82-96, Malaga, Spain, October, 2008. In Proceedings of the 27th IEEE International Symposium on Reliable Distributed Systems (SRDS), Napoli, Italy, October, 2008. In Proceedings of the 15th IEEE International Conference on Network Protocols (ICNP), pages 226-275, Beijing, China, October 2007. In Proceedings of the 12th European Symposium Research Computer Security (ESORICS), pages 155-170, Dresden, Germany, September 2007. In Proceedings of the IEEE International Conference on Dependable Systems and Networks (DSN), pages 128-137, Yokohama, Japan, June 2005. In Proceedings of the 4th International Workshop on Assurance in Distributed Systems and Networks (ADSN), Columbus, Ohio, June 2005. Firewall Queriesbr> Alex X. Liu, Mohamed G. Gouda, Huibo Heidi Ma, and Anne HH. Ngu. In Proceedings of the 8th International Conference on Principles of Distributed Systems (OPODIS), Grenoble, France, December 2004. Alex X. Liu and Mohamed G. Gouda. In Proceedings of SIGCOMM, Portland, Oregon, August, 2004. In Proceedings of the IEEE International Conference on Dependable Systems and Networks (DSN), pages 595-604, Florence, Italy, June 2004. In Proceedings ofthe 24th IEEE International Conference on Distributed Computing Systems (ICDCS), pages 320-327, Tokyo, Japan, March 2004. Muhammad Shahzad, M. Zubair Shafiq, and Alex X. Liu. IEEE Transactions on Dependable and Secure Computing (TDSC), in press, 2019. Yadang Chen, Chuanyan Hao, Alex X. Liu, and Enhua Wu. IEEE Transactions on Multimedia (TMM), in press, 2019. Chengwen Luo, Xiao Liu, Wanli Xue, Yiran Shen, Jianqiang Li, Wen Hu, and Alex X, Liu. IEEE/ACM Transactions on Networking (ToN), in press, 2019. Han Ding, Jinsong Han, Alex X. Liu, Wei Xi, Jizhong Zhao, Panlong Yang, and Zhiping Jiang. IEEE Transactions on Mobile Computing (TMC), in press, 2019. Zhuangdi Zhu, Alex X Liu, Fan Zhang, and Fei Chen. IEEE Transactions on Cloud Computing (TCC), in press, 2019. Jian Su, Zhengguo Sheng, Liangbo Xie, Gang Li, and Alex X. Liu. IEEE Transactions on Communications (TCOM), in press, 2019. Xun Zhou, Huigui Rong, Chang Yang, Qun Zhang, Amin Vahedian Khezerlou, Hui Zheng, Zubair Shafiq, and Alex X. Liu. IEEE Transactions on Big Data (TBD), in press, 2019. IEEE Transactions on Network Science and Engineering (TNSE), in press, 2019. Zhangjie Fu, Jiashuang Xu, Zhuangdi Zhu, Alex X. Liu, and Xingming Sun. IEEE Transactions on Mobile Computing (TMC), Vol. 18, No. 2, pages 473-484, February 2019. Haipeng Dai, Muhammad Shahzad, Alex X. Liu, Meng Li, and Yuankun Zhong. IEEE/ACM Transactions on Networking (ToN), Vol. 26, No. 6, pages 2429-2442, December 2018. Yangming Zhao, Chen Tian, Zhuangdi Zhu, Jie Cheng, Chunming Qiao, and Alex X. Liu. IEEE Transactions on Parallel and Distributed Systems (TPDS), Vol. 29, No. 11, pages 2514-2527, November 2018. Fei Chen, Donghong Wang, Ronghua Li, Jianyong Chen, Zhong Ming, Alex Liu, Huayi Duan, Cong Wang, and Jing Qin. IEEE Transactions on Information Forensics & Security (TIFS), Vol. 13, No. 11, pages 2677-2690, November 2018. Lei Xie, Qingliang Cai, Alex X. Liu, Wei Wang, Yafeng Yin, and Sanglu Lu. IEEE/ACM Transactions on Networking (ToN), Vol. 26, No. 5, pages 2146-2159, October 2018. Zhangjie Fu, Lili Xia, Xingming Sun, Alex X. Liu, Guowu Xie. IEEE Transactions on Information Forensics & Security (TIFS), Vol. 13, No. 9, pages 2359-2371, September 2018. Xiulong Liu, Xin Xie, Xibin Zhao, Keqiu Li, Alex X Liu, Song Guo, and Jie Wu. IEEE Transactions on Mobile Computing (TMC), Vol. 17, No. 9, pages 2041-2054, September 2018. IEEE/ACM Transactions on Networking (ToN), Vol. 26, No. 4, pages 1907-1920, August 2018. Tong Yang, Gaogang Xie, Alex X. Liu, Qiaobin Fu, Yanbiao Li, and Xiaoming Li. IEEE/ACM Transactions on Networking (ToN), Vol. 26, No. 4, pages 1821-1836, August 2018. Haipeng Dai, Xiaoyu Wang, Alex X Liu, Huizhen Ma, and Guihai Chen. IEEE/ACM Transactions on Networking (ToN), Vol. 26, No. 4, pages 1865-1878, August 2018. Fu Xiao, Lei Chen, Chaoheng Sha, Lijuan Sun, Ruchuan Wang, Alex X Liu, and Faraz Ahmed. IEEE/ACM Transactions on Networking (ToN), Vol. 26, No. 4, pages 1701-1714, August 2018. Chen Tian, Ali Munir, Alex X. Liu, Jie Yang, and Yangming Zhao. IEEE/ACM Transactions on Networking (ToN), Vol. 26, No. 3, pages 1488-1501, June, 2018. Wenxin Li, Deke Guo, Alex X Liu, Keqiu Li, Heng Qi, Song Guo, Ali Munir, Xiaoyi Tao. IEEE Transactions on Parallel and Distributed Systems (TPDS), Vol. 29, No. 5, pages 1013-1029, May 2018. IEEE/ACM Transactions on Networking (ToN), Vol. 26, No. 2, pages 657-670, April 2018. Yongzheng Jia, Zongpeng Li, Franck Le, Alex Liu. IEEE/ACM Transactions on Networking (ToN), Vol. 26, No. 2, pages 699-710, April 2018. IEEE/ACM Transactions on Networking (ToN), Vol. 26, No. 1, pages 76-89, February, 2018. Haipeng Dai, Huizhen Ma, and Alex X. Liu. IEEE/ACM Transactions on Networking (ToN), Vol. 26, No. 1, pages 314-327, February, 2018. Lei Xie, Chuyu Wang, Alex X. Liu, Jianqiang Sun, and Sanglu Lu. IEEE/ACM Transactions on Networking (ToN), Vol. 26, No. 1, pages 231-244, February, 2018. Haipeng Dai, Yunhuai Liu, Guihai Chen, Xiaobing Wu, Tian He, Alex X. Liu, and Yang Zhao. IEEE/ACM Transactions on Networking (ToN), Vol. 26, No. 1, pages 520-533, February, 2018. Le Sun, Hai Dong, and Alex X. Liu. IEEE Access, Vol 6, pages 68104-68136, 2018. IEEE/ACM Transactions on Networking (ToN), Vol. 25, No. 6, pages 3709-3722, December, 2017. Haipeng Dai, Yunhuai Liu, Guihai Chen, Xiaobing Wu, Tian He, Alex X. Liu, and Huizhen Ma. IEEE/ACM Transactions on Networking (ToN), Vol. 25, No. 6, pages 3531-3544, December, 2017. Jingpu Duan, Chuan Wu, Franck Le, Alex X. Liu, and Yanghua Peng. IEEE Journal on Selected Areas in Communications (JSAC), Vol. 35, No. 11, pages 2501-2511, November, 2017. IEEE Transactions on Mobile Computing (TMC), Vol 16, No. 10, Pages 2726-2741, October, 2017. Xiulong Liu, Keqiu Li, Song Guo, Alex X. Liu, Peng Li, Kun Wang, and Jie Wu. IEEE/ACM Transactions on Networking (ToN), Vol. 25, No. 5, pages, 2587-2600, October, 2017. Tong Yang, Alex X. Liu, Muhammad Shahzad, Dongsheng Yang, Qiaobin Fu, Gaogang Xie, and Xiaoming Li. IEEE/ACM Transactions on Networking (ToN), Vol. 25, No. 5, pages 3116-3131, October, 2017. Amin Khezerlou, Xun Zhou, Lufan Li, Zubair Shafiq, Alex X. Liu, and Fan Zhang. ACM Transactions on Intelligent Systems and Technology (TIST)). Vol. 8, No. 6, pages 1-24, September, 2017. Amir R. Khakpour, Alex X. Liu, Joshua W. Hulst, Zihui Ge, Dan Pei, and Jia Wang. IEEE Transactions on Information Forensics & Security (TIFS), Vol. 12, No. 7, pages 1699-1712, July 2017. Yousef Atoum, Liping Chen, Alex Liu, Stephen Hsu, and Xiaoming Liu. IEEE Transactions on Multimedia (TMM), Vol. 19, No. 7, pages 1609-1624. July 2017. IEEE/ACM Transactions on Networking (ToN), Vol. 25, No.1, pages 596-609, February 2017. Ali Munir, Ghufran Baig, Syed Muhammad Irteza, Ihsan Ayyub Qazi, Alex X. Liu, and Fahad Dogar. IEEE/ACM Transactions on Networking (ToN), Vol. 25, No. 1, pages 320-334, February 2017. Xiulong Liu, Keqiu Li, Alex X. Liu, Ann Wang, Jie Wu, and Xin Xie. IEEE/ACM Transactions on Networking (ToN), Vol. 25, No. 1, pages 264-277, February 2017. Xiulong Liu, Bin Xiao, Keqiu Li, Alex X Liu, Jie Wu, Xin Xie, and Heng Qi. IEEE/ACM Transactions on Networking (ToN), Vol. 25, No. 1, pages 224-237. February, 2017. Kamran Ali, Alex X. Liu, Wei Wang, Muhammad Shahzad. IEEE Journal on Selected Areas in Communications (JSAC), Vol. 35, No. 5, pages 1175-1190, January 2017. Wei Wang, Alex X. Liu, Muhammad Shahzad, Kang Ling, and Sanglu Lu. IEEE Journal on Selected Areas in Communications (JSAC), Vol. 35, No. 5, pages 1118-1131, January 2017. IEEE/ACM Transactions on Networking (ToN), Vol. 24, No.4, pages 2400-2415, August 2016. IEEE/ACM Transactions on Networking (ToN), Vol. 24, No. 7, pages 1295-1307, June 2016. IEEE/ACM Transactions on Networking (ToN), Vol. 24, No. 3, pages 1308-1321, June 2016. IEEE/ACM Transactions on Networking (ToN), Vol. 24, No. 6, pages 3770-3784, February 2016. IEEE/ACM Transactions on Networking (ToN), Vol. 24, No. 6, pages 3477-3492, February 2016. IEEE/ACM Transactions on Networking (ToN), Vol. 24, No.1, pages 610-623, February 2016. IEEE Transactions on Parallel and Distributed Systems (TPDS), Vol. 27, No. 11, page 3226-3241, January 2016. IEEE Transactions on Mobile Computing (TMC), Vol. 14, No. 7, pages 1369-1381, July 2015. Fei Chen, Bezawada Bruhadeshwar, and Alex X. Liu. IEEE/ACM Transactions on Networking (ToN), Vol. 23, No. 3, pages 946-958, June, 2015. IEEE/ACM Transactions on Networking (ToN), Vol. 23, No. 3, pages 796-809, June, 2015. IEEE/ACM Transactions on Networking (ToN). Vol. 23, No. 1, pages 241-254, February 2015. IEEE Transactions on Knowledge and Data Engineering (TKDE). Vol. 27, No. 5, 1438-1451, January, 2015. Xiulong Liu, Heng Qi, Keqiu Li, Ivan Stojmenovic, Alex Liu, Yanming Shen, Wenyu Qu, and Weilian Xue. IEEE Transactions on Communications (TCOM). Vol. 63, No. 4, pages 1432-1442, January, 2015. Xiulong Liu, Keqiu Li, Geyong Min, Yanming Shen, Alex X. Liu, and Wenyu Qu. IEEE Transactions on Computers (TC). Vol. 64, No. 1, pages 87-96, January 2015. Jignesh Patel, Alex X. Liu, and Eric Torng. IEEE/ACM Transactions on Networking (ToN). Vol. 22, No. 6, pages 1701-1714, December, 2014. Sen Su, Zhongbao Zhang, Alex X. Liu, Xiang Cheng, Yiwen Wang, and Xinchao Zhao. IEEE/ACM Transactions on Networking (ToN).Vol. 22, No. 5, pages 1607 - 1620, October 2014. Alex X. Liu, Chad Meiners, Eric Norige, Eric Torng. IEEE Journal on Selected Areas in Communications (JSAC). Vol. 32, No. 10, pages 1864-1880, October 2014. Tingwen Liu, Alex X. Liu, Jinqiao Shi, Yong Sun, Li Guo. IEEE Journal on Selected Areas in Communications (JSAC). Vol. 32, No. 10, pages 1797-1809, October 2014. Yiwen Wang, Sen Su, Alex X. Liu, and Zhongbao Zhang. Special Issue on Communications and Networking in the Cloud, Journal of Computer Networks (COMNET) (Elsevier). Vol. 68, No. 5, pages 123-137, August 2014. IEEE Transactions on Communications (TCOM), Vol. 62, No. 3, March 2014. Chad R. Meiners, Jignesh Patel, Eric Norige, Alex X. Liu, and Eric Torng. IEEE/ACM Transactions on Networking (ToN), Vol. 22, No. 1, pages 94-109, February 2014. IEEE/ACM Transactions on Networking (ToN), Vol. 21, No. 6, pages 1960-1973, December 2013. M. Zubair Shafiq, Muhammad U. Ilyas, Alex X. Liu, and Hayder Radha. IEEE Journal on Selected Areas in Communications (JSAC), Vol. 31, No. 9, pages 618-628, September 2013. Muhammad U. Ilyas, M. Zubair Shafiq, Alex X. Liu, and Hayder Radha. IEEE Journal on Selected Areas in Communications (JSAC), Vol. 31, No. 9, pages 629-640, September 2013. IEEE/ACM Transactions on Networking (ToN), Vol. 21, No. 4, pages 1076-1089, August 2013. IEEE/ACM Transactions on Networking (ToN), Vol. 21, No. 3, pages 857-868, June 2013. Kanthakumar Pongaliur, Li Xiao, and Alex X. Liu. Journal of Supercomputing (Springer), Vol. 64, No. 3, pages 717-743, June 2013. Alex X. Liu and Amir R. Khakpour. IEEE/ACM Transactions on Networking (ToN), Vol. 21, No. 2, pages 551-565, April 2013. IEEE/ACM Transactions on Networking (ToN), Vol. 20, No. 6, pages 1774-1787, December 2012. Fei Chen, Alex X. Liu, JeeHyun Hwang, and Tao Xie. ACM Transactions on Autonomous and Adaptive Systems (TAAS), Vol. 7, No. 2, pages 27-49, July 2012. M. Zubair Shafiq, Chad Meiners, Zheng Qin, Ke Shen, and Alex Liu. Journal of Network and Systems Management (JNSM) (Springer), Vol. 21, No. 3, pages 335-352, May 2012. Chad R. Meiners, Alex X. Liu, and Eric Torng. IEEE/ACM Transactions on Networking (ToN), Vol. 20, No. 2, pages 488-500, April 2012. Jeehyun Hwang, Tao Xie, Fei Chen, and Alex X. Liu. IEEE Transactions on Network and Service Management (TNSM), Vol. 9, No. 1, pages 1-11, March 2012. ACM Transactions on Internet Technology (TOIT), Vol. 11, No. 4, pages 15-39, March 2012. Note: This paper was selected as the course material in Purdue's Computer Science Course CS 590N ``Logical Methods for Information Security''. Zheng Qin, Fei Chen, Qiang Wang, Alex X. Liu, Zhiguang Qin. Journal of Supercomputing (Springer), Vol. 59, No. 3, pages 1577-1595, March, 2012. Yanni Sun, Osama Aljawad, Jikai Lei, Alex Liu. BMC Bioinformatics, Vol. 13, No. 3, pages 1-13, March, 2012. Journal of Computer Networks (COMNET) (Elsevier), Vol. 56, No. 6, pages 1723-1730, January 2012. Note: The web security scheme proposed in this paper has been used by Wordpress since version 2.4. Wordpress is a widely used open source content management system. The adoption of our scheme was announced by Ryan Boren, a lead developer of WordPress, in 2007 in his article "Secure Cookies and Passwords". Our paper was also selected as part of the course material in Stanford Computer Science Course CS259 "Security Modeling and Analysis" in 2012. IEEE Transactions on Parallel and Distributed Systems (TPDS), Vol. 22, No. 12, pages 1969 - 1977, December 2011. IEEE Transactions on Computers (TC), Vol. 60, No. 12, pages 1802 - 1817, December 2011. IEEE Transactions on Parallel and Distributed Systems (TPDS), Vol. 22, No. 5, pages 887 - 895, May 2011. IEEE Transactions on Parallel and Distributed Systems (TPDS), Vol. 22, No. 2, pages 1536-1549, January 2011. Journal of Security and Communication Networks (SCN), Vol. 3, No. 5, pages 384-393, September 2010. IEEE/ACM Transactions on Networking (ToN), Vol. 18, No. 2, pages 490 - 500, April 2010. IEEE Transactions on Parallel and Distributed Systems (TPDS), Vol. 21, No. 4, pages 424-437, April 2010. IEEE/ACM Transactions on Networking (ToN), Vol. 19, No. 1, pages 237-250, February 2010..
Journal of Computer Networks (COMNET) (Elsevier), Vol. 53, No. 16, pages 2800-2809, November 2009. IEEE Transactions on Parallel and Distributed Systems (TPDS), Vol. 20, No. 6, pages 766-777, June 2009. Journal of Computer Communications (COMCOM) (Elsevier), Vol. 32, Issues 7-10, Pages 1194-1199, May 2009.